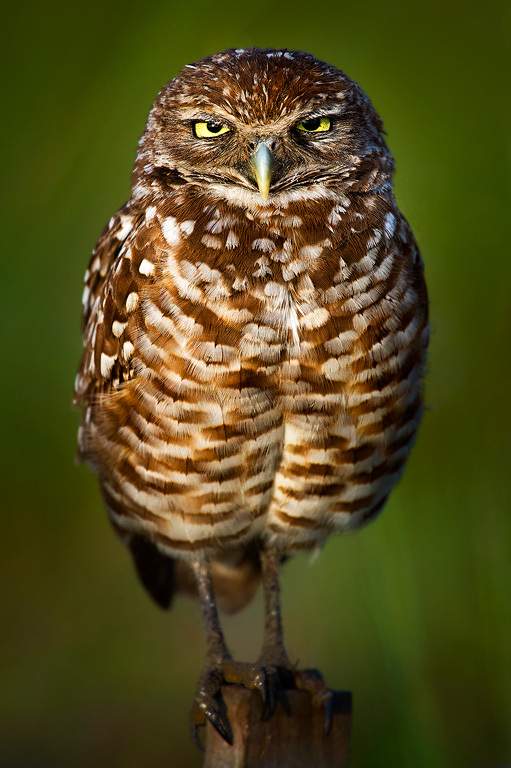 Today I want to write about a really cool bird that looks cute and grumpy all at once, the burrowing owl. These funny looking owls grow about 25 cm tall. They are called burrowing owls as they are the only owls in the world that lives in underground burrows. These burrows have mostly been built by prairie dogs or other small mammals, but they do have the ability to dig their own. When threatened, they hide in their burrow and can make a noise that sounds like a rattlesnake, which scares away their enemies. They are excellent hunters, catching insects, small mammals, birds and reptiles by either swooping on them from above or chasing them on the ground, using their extra long legs to run really fast. They have also been seen placing animal dung around their burrows to attract dung beetles which they then catch and eat. They are very clever! At breeding time, the females lay up to 11 eggs in the burrow, although less than half will survive to adulthood. The mum looks after the eggs and the chicks when they are very young while the dad hunts for food and brings it back to the burrow. Burrowing owls have a very large range throughout North and South America. They live in open grasslands, and in many areas of South America have increased in numbers to due the cutting down of forests. Are there any other interesting facts that you would like to share about burrowing owls? 11 Eggs…so many for a raptor, interesting fact. i think burrowing owls are asome. i love all the facts u give! but try to gather more information so we get more and u get more! thats a lot if things you put up there you should really make 10 facts about them!!! !